Kuraray - Pioneering technology that improves the environment and enhances the quality of life throughout the world. Pioneering technology that improves the environment and enhances the quality of life throughout the world. Beaufit is a side-by-side conjugate of PET and PBT. Beaufit has a soft stretch, an excellent recovery, good dye fastness and a high durability. excellent durability and dimensional stability to laundering. CONTACT US for more information or if you are interested in Beaufit. Dual performance of photo-catalytic reaction and chemical neutralization. In general, deodorizing can be carried out by several ways: such as chemical reaction with odour particle, phsysical absorption, sensous masking or biological method (anti-bacterial agent to kill germs to prevent odour generation). Shine-up hires the chemical neutralizing reaction and photo-catalytic reaction activated by sepcial ceramics containing metal. Light can clean air by photo catalysis. The deodorizing system of Shine-up consists of 2 stages: absorption of odorant particle into the ceramic in the fiber, followed with photo-catalytic reation leadas to decomposition of odorant molecule into CO2 and H2O by the oxidant generated by the light radiation. Can it work under fluorescent lamp? The photo-catalytic reaction is carried out by the radiation of UV below 400 nm wavelength normally found both in sunlight and in-door light source. Thus fairly weak light source of fluorescent lamp can develop the deodorization reactions. Shine-Up, new odor buster in our daily life. The odor we smell daily is chemical compound of different materials like ammonia, hydrogen sulfide and acetic acid. In case of cigarette fume, it has more than 3000 chemicals. It has been difficult to deodorize with conventional deodorizing fiber because they have narrow allowance of function. THE POWER OF 2 STEP DEODORIZING. Evaluation method of deodorizing (Tedlar-bag method): 3g of specimen fabric and 3L of the odorant gas are put in 3L Tedlar-bag. After the predetermined retention time (2 hours and 24 hours), the concentration of odorant gaseous particles is measured. Evaluation method of discharging of odorant (Kuraray method): The specimen tested in above Tedlar-bag method and fresh air is put in the 3L Tedlar-bag. The bag is heated at 40°C; for 1 hour todischarge the odorant particles from the specimen. The concentration of discharged gaseous particles is measured. 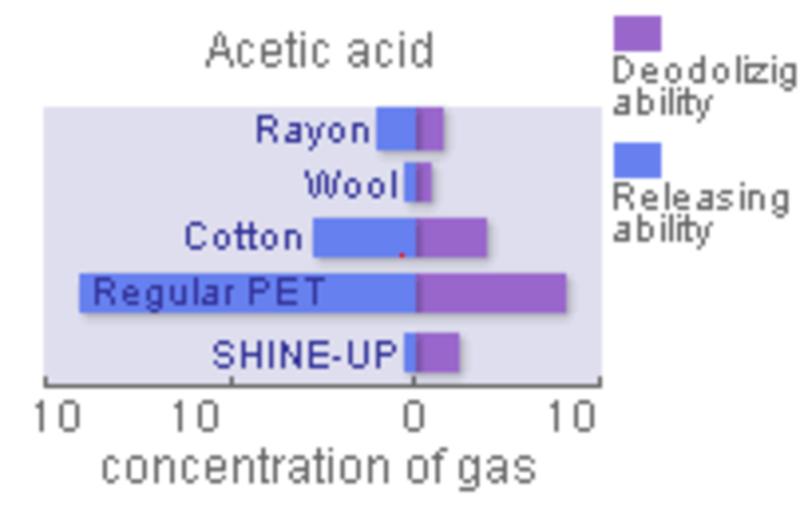 The chart indicates the comparison of deodorizing effect against acetaldehyde, a neutral component, in different conditions; under irradiated light and without light. SHINE-UP demonstrates enough deodorizing ability under the light of only 30W bulb. Even such a small light energy develops photo-catalytic reactions effective to eliminate odor. As for deodorizing by topical treatments on fiber, they have drawbacks, such as tendency to lose the effect after washing and to bechome hard in touch and availability with limited colours. 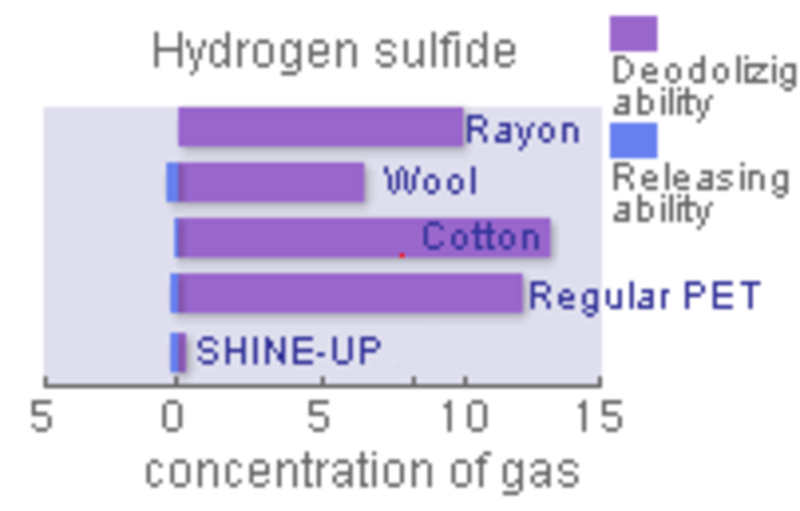 Shine-Up is produced by componding deodorant ceramics in the polymer through melt-spinning process. The sheath-core type yarn is available as DTY. Because of being compounded in the extrusion process, Shine-Up has higher durability to maintain the performance after repeated washing. The fabric made with Shine-Up has physical properties similar to that of regular polyester, it is easy to dye and finish and retain texture of the fabric without chemical treatment. CONTACT US for more information or if you are interested in Shine-Up / Claretta. Sophista is a breakthrough material developed by Kuraray, the largest manufacturer of EVAL (EVOH) resin in the world. This is the first synthetic fiber that combines the comfort and feel of natural fiber with the function of synthetic fiber. This aqua-friendly fiber with hydrophilic radical is perfectly compatible with human body. Sophista is a leading edge product of fiber technologies in the 21st century. Affinity for water is the original concept of Sophista's characteristic. Sophista is aqua-friendly fiber holding hydrophilic radical. Sophista is the first fiber with hydrophilic radical (-OH) thus enabling to absorb and diffuse water. It has realized a real comfortable and gentle touch to human skin which has never been able with synthetic fiber. Sophista does not swell nor stock to the skin as in the case with natural fiber when they are wet. Sophista maintains both fiber and skin surface dry. The saturated fiber with water will become soggy and sticky to the skin. It not only makes wearer uncomfortable, but it also takes time to be dried. The lack of hydrophilic radical in the fiber does not allow absorption of the sweat and water. Though the fiber does not swell, it holds sweat on fiber surface changing into uncomfortable and soggy liquid layer between skin and fiber. Sophista can absorb and diffuse not only sweat but also the body heat by evaporation of water. With this wicking effect, Sophista makes you feel cool and dry. Sophista absorbs sweat on the fiber surface and evaporates quickly. Sophista has better quick-dry performance than normal polyester considered as a good quick-dry performance fiber. A test has been done pouring 10g/m2 of water on a garment made of Sophista and normal polyester as a comparison. The polyester garment took 45 min to dry completely, whereas Sophista took only 30 min. Sophista helps your body to maintain normal tempereature while at work or on exercise. A garment made of Sophista can keep your body cooler than any other synthetic or natural fibers including even silk when you do some light work. Sophista can maintain your body temperature at comfortable level by evaporation heat caused by quick absoprtion and diffusion of water. It also prevents a quick drop of body tempereature which occurs mostly after you stopped working or exercising because of wearing soggy garment. Gentle and tough. Useful easy care. Stain can be washed off easily from the fiber. In the daily life, clothes can easily be stained with various kinds of substances. Sophista can make the laundry easier because stain can be washed off easily while maintaining the durability against repeated wash cycles. Unlike natural fiber like wool or silk, you can wash the garment made of Sophista at home saving time and expenses to go to professional laundries. Cost performance is another advantage of the comfort fabric that looks always neat. Basic structure of Mintval is the one of Exceval. Exceval is both heat moldable and water soluble polymers that has been devloped by Kuraray. Mintval is a filament from melt spinning process what leads to a reasonable price. 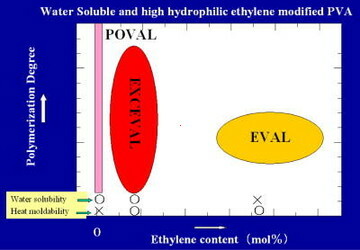 Furthermore, Mintval is water soluble at 90°C and eco-friendly because of its biodegredability. Set the practical treating time according to the result of checking reminded Mintval.